The first book in this series was, quite possibly, my favourite read of the year. 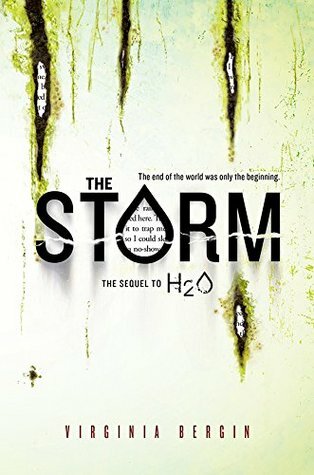 Before I get to The Storm let me first say, I read H2O, the first book in this series, to prep for reading The Storm, and because the publisher kindly gave me a copy of it to read as well. Easily in the top five books I've read this year (a number that's nearly 160 books right now). H2O made me sob, made me smile, made me snicker. There were a lot of tears. The Storm picks up after the end of H2O, with Ruby alone and slowly losing her mind. She isn't allowed to remain too 'comfortable' for too long, and soon she's back in a car, trying to sort out the best place to be in this strange, new world. Ruby's voice strikes the perfect tone for experiencing apocalypse. She's a typical teenager, who uses fashion and make-up as deflection and distraction to cover some of the more emotional periods of the book. She's got lots of snark, she's adaptable, and she's straddling that awkward position between child and adult, which makes her seem both vulnerable and capable. The story ripped at my heart. There were small victories, huge disappointments, and plenty of moments for Ruby to step up and prove how much she's grown since her pre-deadly-rain days. The thought of living through everything Ruby's coping with is terrifying. There's definitely the trappings of YA here (Ruby's a teenager, there's a love interest, etc. ), it's not an entirely adult story, but because of the horror of the super-virus, it's definitely not for young readers. Now, I did find that H2O was scarier and more poignant. The plot in that book was simpler--coping with the immediate aftermath of super-virus' arrival, and figuring out how to survive. The Storm goes beyond that to untangle the responses to the virus, to piecing together a new normal. It was no longer enough for Ruby to survive, 'things' (I won't spoil what!) had to happen. I appreciated the necessity of it, but I do think it makes for a slightly weaker story than in H2O. It's a bit less compelling than that first story, possibly because I didn't feel that same sense of urgency or maybe because the basic premise was now familiar to me and the 'more' of this story was a bit more familiar in this genre. I will say that there was one section of the book where I was shouting at it. Which does not often happen. I was completely emotionally invested. I will definitely go back and re-read this books, maybe in a year or two, and probably cry all over again! Grab H2O and then immediately follow it up with The Storm! Seriously. So good. And finally, the publisher is running a giveaway! Absolutely get in on this because, if you can't tell, I LOVED these two books.